The days of brochure websites are long gone. You know, the websites that you put out there with lots of information about your business and then almost forget about it? Maybe it was updated once a year if there was a change to the company’s hours of operation or pricing. Today, users expect websites to be more interactive, and if your website isn’t then you could be missing out on many opportunities. 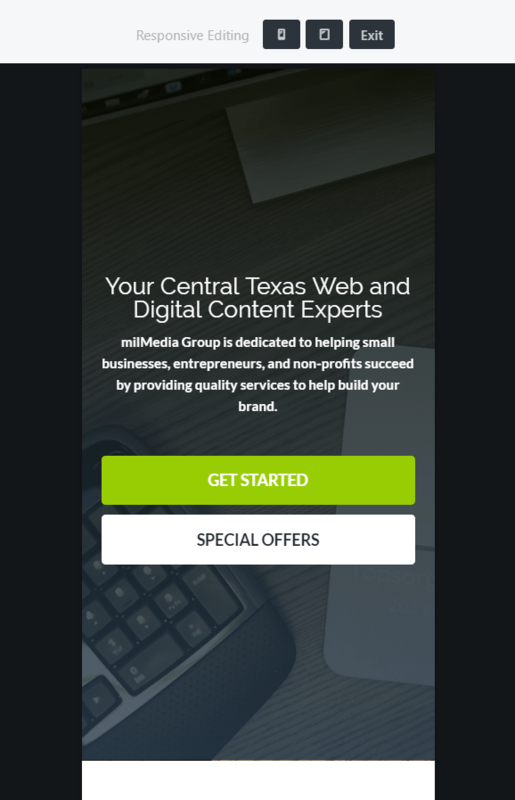 Recently, we redesigned our website here at milMedia, and here are some of the strategies we put in place that you also might want to consider on your next redesign. As mentioned in our last blog posts, you never want to forget about the mobile user. It’s simply out of the question to design a page that isn’t user-friendly on mobile devices today. 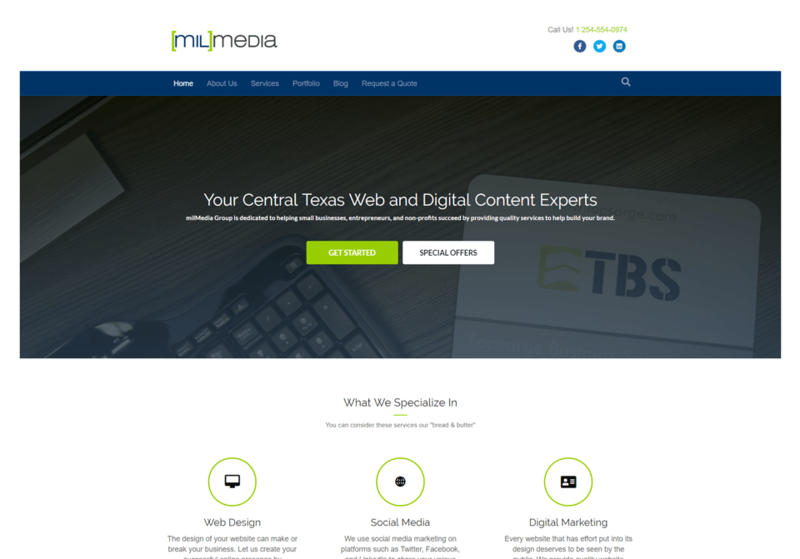 The previous milMedia website was responsive as well, however, on this redesign, we worked with a different WordPress Framework that increased the speed of our website, and kept the mobile version display clean and user-friendly. Lastly, the change in framework gives us the benefit of editing our website, not only in desktop view but now in mobile view as well. If you are visiting us for the first time, milMedia specializes in WordPress websites. There are many, many ways to build a website with WordPress. Keep an eye out for future posts about this new WordPress Framework we are using to make editing our website and some of our clients a much more enjoyable experience. One small but very important item to consider when redesigning with mobile in mind is if you want your users to call add a clickable phone number. We positioned ours at the top of the page, so it is one of the first things you see on our website, and easy to use on a mobile device. Contact forms can go to the next level when you turn them into forms that gather a little bit of information. This will give you a chance to be prepared when responding back via email or giving the customer a call. *Pro tip, add a thank-you page after the form submits and you’re ready to record conversions in Google analytics. This option is best if you have a “warm” audience or people who are familiar with your website. Customers who visit your site often will appreciate the ability to sign up now or schedule an appointment immediately, maybe download helpful info, all depending on the type of business you have of course. For example, we added special promotions to our website to not only offer great rates to our visitors but to give them the ability to get the ball rolling right away. If you know what you are looking for, and you don’t want to wait around for a quote, then why not buy a website now and get started right away, right? design choices that your customers respond to that matters. After any website launches it’s important to monitor your user activity. Gather feedback from your audience if you can and use tools such as Google Analytics to collect important data such as what browser people are using to view your website. Are they viewing it on mobile or desktop more? For even more data, we recommend Mouseflow.com. Mouseflow (a tool developed right here in Texas by the way) is a tool that allows you to not only track where your visitors are coming from, what pages they are viewing, what devices they are using, but it also gives you videos of exactly what they are seeing when they viewed the website. Once you start using Mouseflow you will become addicted to watching these videos to see what your website looks like to your visitors, as well as where they click and how they navigate the site on a mobile device. Once you see this info you can use it to continue to improve your website based on actual customer feedback. There are many reasons to seek a new website, however, one of the most important is if your website is not working for you. If it’s bringing you more customers as it should be, then you’re on the right track. Maybe it’s not showing up in Google Search, or people find it but then leave before going deeper into the site? Do you need to build an email list or integrate your CRM with your website? If any of these questions are on your mind, we would love to learn more about your business and create the right purposeful strategy for you. Check out our current web design offer, and sign up for a free consultation today.